This grand 19th century French Louis XVI hand-carved oak panel is over nine feet tall! Makes is a great choice for dramatic adding a touch of style to any narrow space! Hand-sculpted from one solid plank of oak, it features classical motifs depicting a bird on a nest, ribbons and bows, floral and foliate sprays, musical instruments, a worldly globe, and even a classical urn, all on one work of art, circa 1870s Measures 109.5 H x 21 W.
This item is in our Dallas showroom NOT our Baton Rouge showroom. This stunning decorative carved oak panel, circa 1890, is in excellent condition for its age. 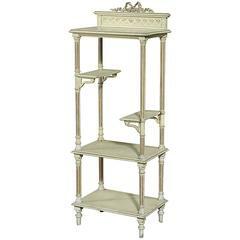 Measures: Height 58 cm Width 105.5 cm Depth 4.2 cm Weight 12 kg. 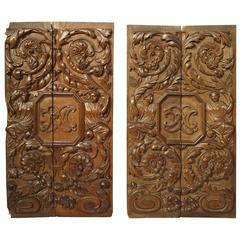 Two French 19th century hand carved walnut panels. Two large French 19th century curved hand carved walnut panels.